Just when we thought we were at a tomato dead-end out here (not really—that’ll never happen), along comes ‘Indigo Rose’. Named after a burlesque dancer? Nope, it’s the color. 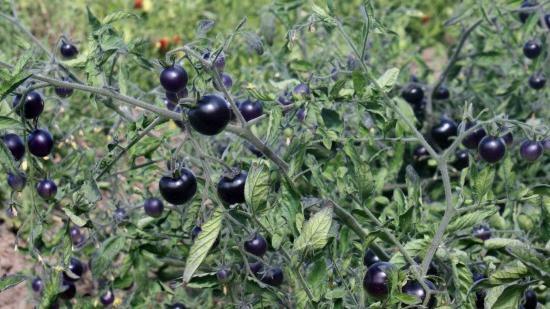 Oregon State University released the much anticipated purple tomato this year…anticipated as much as a vintage of wine. I mean, this baby even has her own 700-word press release. ‘Indigo Rose’ isn’t purple-ish. It’s dark purple. And we’re not talking GMO Franken-fruit. We’re talking good, old-fashioned, open-pollinated breeding. The reason for the showy color: anthocyanin, a dark colored antioxidant with potentially powerful health benefits. My friends in Salem, Oregon at Minto Island Growers (our favorite farmers, of food truck fame) are growing a field of them. Stunning. The actual leaves are darker purple. And the fruit…oh, the fruit. It’s as dark as eggplant. And it gets red on the bottom when it’s ripe. It’s gorgeous. But…the bad news…it’s supposed to taste just like a “regular tomato,” as anthocyanins are tasteless. There’s no nice way of saying this, Indigo: You lacked flavor. But you sure are pretty. So fingers crossed that some deliciousness gets bred back in. Otherwise we’ll definitely be planting ‘Indigo Rose’ next year but only as an ornamental.